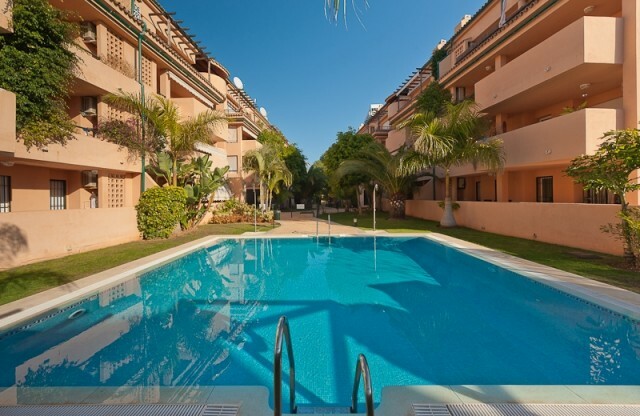 Residencial Playa Alicate is located third row from the beach and situated in a nice suburb of Marbella, called El Rosario. The complex is completely gated with security guard during night times. The apartment is built in a family friendly complex. It has 2 bedrooms & 2 bathrooms and private parking in the underground garage. The complex includes 2 swimming pools and 1 pool for small children. One pool area including the small pool for children is closed during low season 1 Oktober - 31 March. From the hallway the living is to your right, the kitchen straight forward and the bedrooms and bathrooms to your left. The living presents itself nicely with a dining table for 6 persons and a lounge with sofa and 1 arm chair. When passing the sofa area you enter the terrace of approximately 20 m2 through sliding doors with dining table for 6 person.. The terrace is facing west and there is sunshine from midday until sunset. The master bedroom has also direct access to the terrace area and has 2 single beds (each 90*200 cm) with en suite bathroom with toilet, bidet, wash and a combination of bathtub/shower. The other bedroom has 2 single beds of also 90 *200 cm. The bedrooms are fitted with a build closet each. The second bathroom has shower, wash and toilet. Air conditioning: Entire apartment with one central unit. In Spain all TV is received through basic community Satellite. The channels are basically Spanish, though with some international channels. There is free WIFI through a mobile system in the apartment. You do not need a car with this holiday home, since all is in walking distance; beach, supermarket, bakery, paper shop, beauty shop and restaurants. You can take a walk along the beach to the east and along the beach you find all kind of restaurants, bars and beach clubs and the typical Spanish chiringuitos (beach bars). Check out Bono's Beach or South Beach with live entertainment throughout summer holidays. Distance to the cozy old Town of Marbella is 5 km and it is a 15 minutes' drive to the famous harbor of Puerto Banus, where high end designer shops, exclusive yachts, fast cars, discotheques and bars and a great variety of restaurants is presented. Also in the middle of Europe's greatest golf area with over 30 golf courses. There is a possibility of 1 extra bed in the holiday home. Price Euro 75 per bed including 1 set of bed sheets and towels. Ask the office.